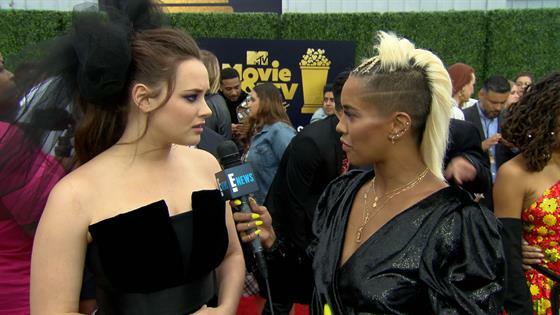 13 Reasons Why's Hannah Baker will live forever—at least for Katherine Langford. Netflix renewed the teen drama for a third season and Langford, who was nominated for a Golden Globe for portraying the teen girl who takes her own life and leaves her reasons behind for her peers to listen to, announced she would not return to the series via an Instagram post. "Even though I say that I am wrapped, I still am very much a part of this show. A few of the cast, we all started season one together, we went through everything together, but I think it was about time—it just felt right for Hannah to leave. I'm so excited for the show and what it's going to continue to do," Langford told E! News' Sibley Scoles at the 2018 MTV Movie and TV Awards. "Hannah's story, it's always going to be part of my life and a part of other people's lives," Langford added, noting she was excited for other projects in the pipeline. The first season of the series featured Langford's Hannah Baker narrating the story as Clay (Dylan Minnette) listened to her 13 tapes, the 13 reasons why she took her own life. The second season featured narration provided by other characters as they took the stand in the Baker family's lawsuit with the school district following Hannah's death. Alisha Boe, Jessica on the Netflix drama, said Langford's exit stirred up a lot of emotions. "We are family," Boe told E! News. "Even if she's not on the show, we're all going to be in touch. She is part of us, forever. We're all lifelong friends. It's going to be hard without Katherine…I just love her a lot." 13 Reasons Why season three will debut in 2019.